What we have here is my Raleigh Record. 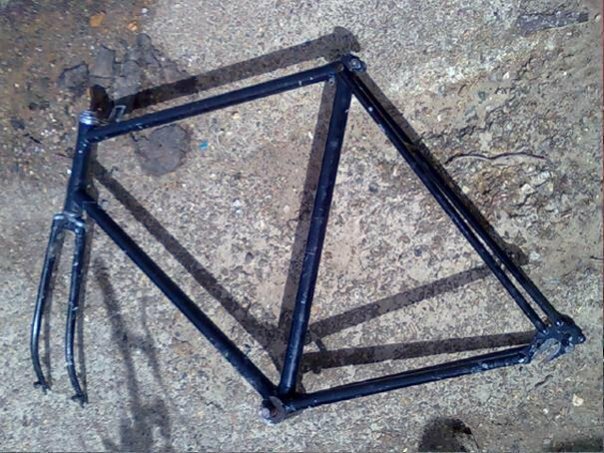 It has been with me since the mid nineties when i rescued the frame from a skip. I will never sell it! It has been through several re-incarnations over the years, and is currently, and very slowly going through another one. This was the first re-incarnarnation. 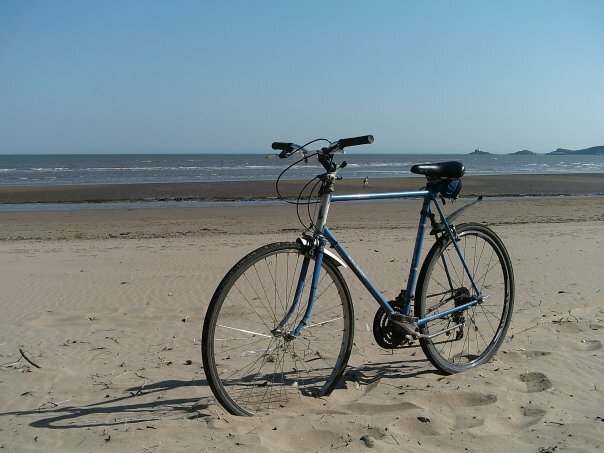 As bikes go, i love this one, it rides nice, it is a little heavy (by modern standards) and it's comfy. Comedy photo of it midway through it's second, or third re-incarnation. How it looks currently, while awaiting it's turn at yet another re-incarnation. 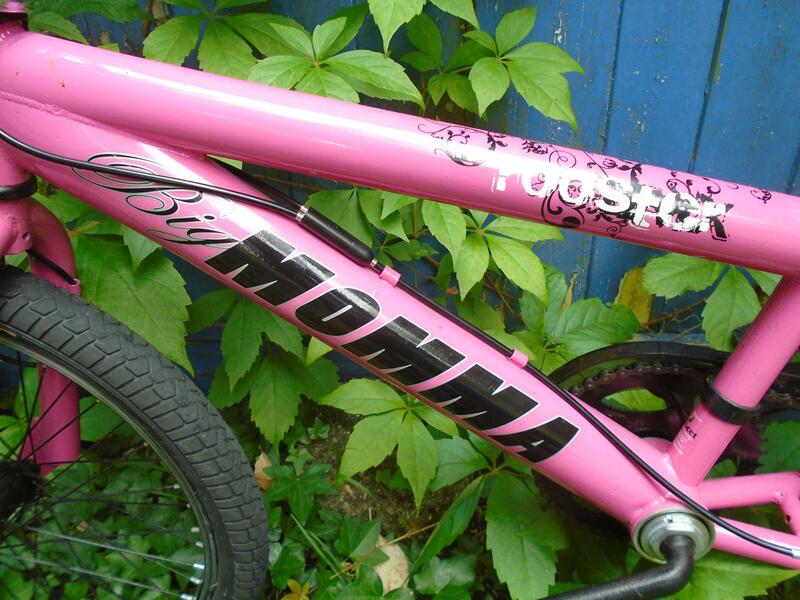 This bike has been responsible for the loss of interest in many other bikes, including a bike that i bought brand new! But i'll get to that in a minute! 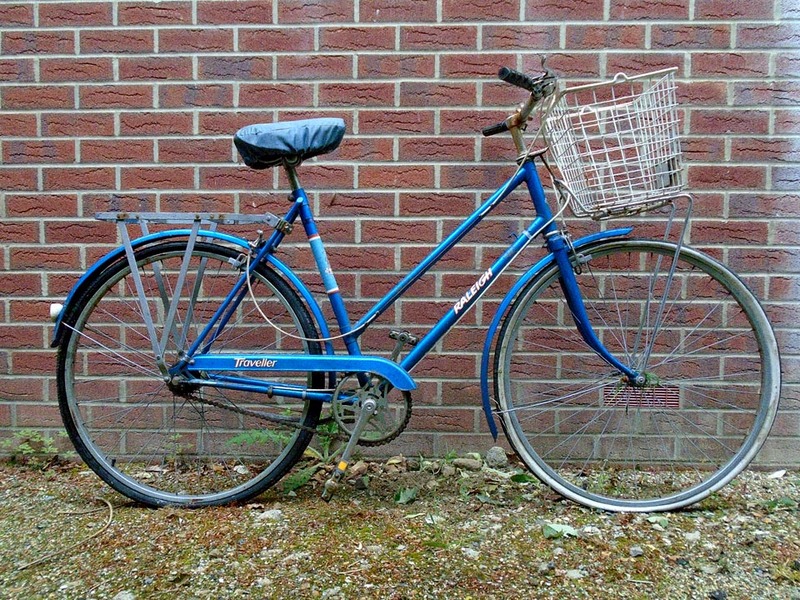 Next up, the only bike that has nearly made me sell the Raleigh Record. 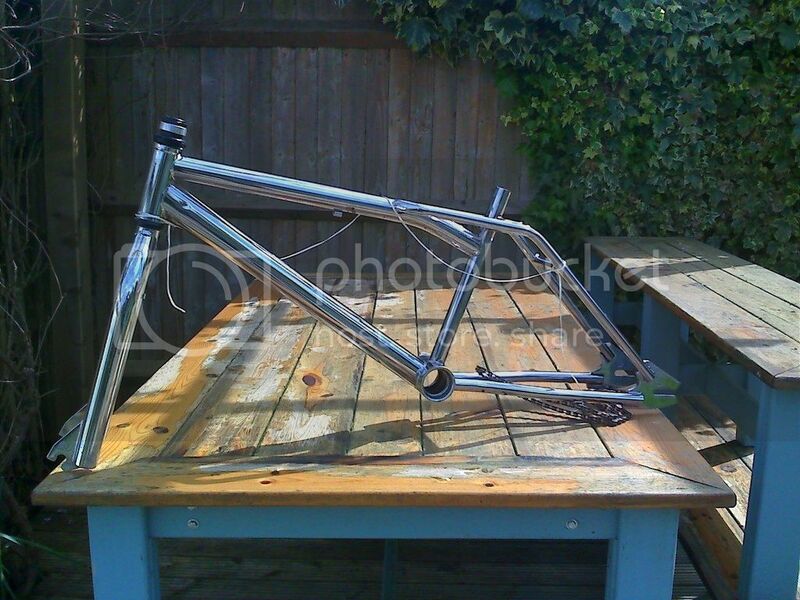 I basically robbed the Raleigh Rocord of all it's bits to build it, hence why i nearly sold the Rekord. 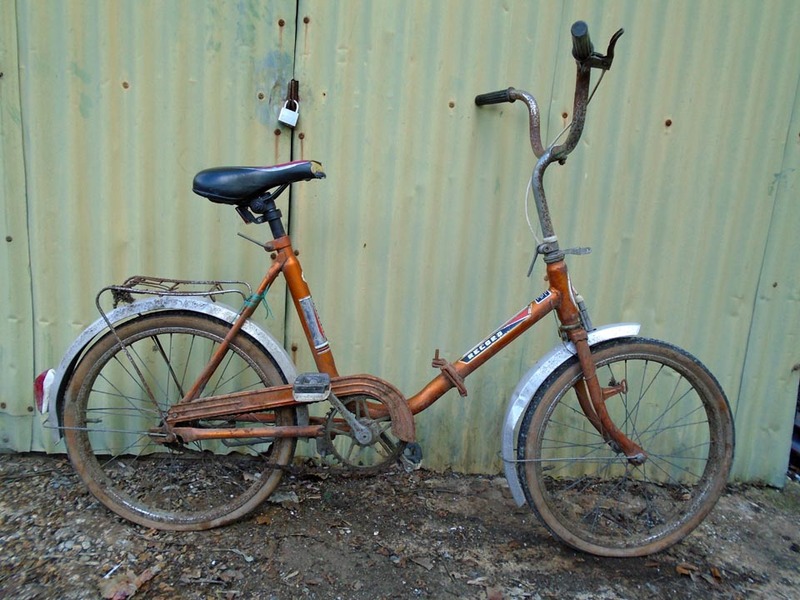 I then came to my senses and just re-built the record with bits from a womans bike i was given! Mr. F. was impressed with the build of the Palm Beach when he saw it again. However it is now undergiong yet another transformation, back to something nearer to it's stock configuration, sadly Mr F. wont get to see it this time as he died at the beginning of 2015. 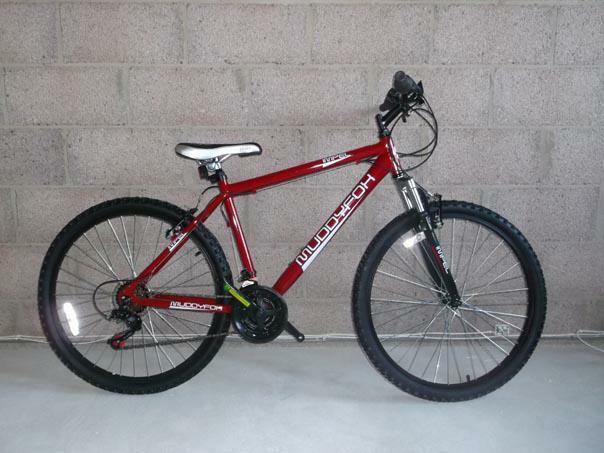 I bought this Saracen Mantis brand new. 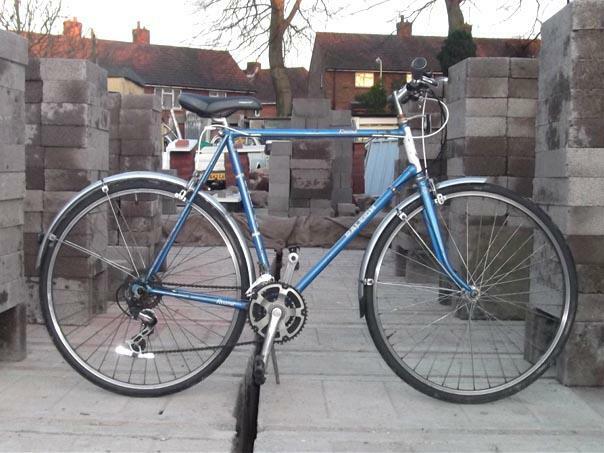 This is the first bike i ever bought brand new, i saved like crazy to get it by working on a building site through the summer holidays when i was at school. I have had it since 1986, and no, it won't be for sale! 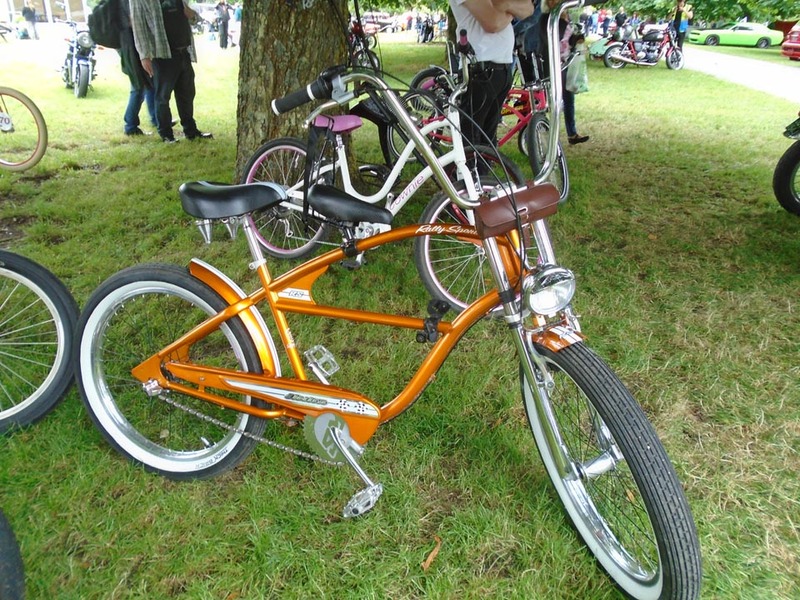 It's a Puch Mountain Cougar, and it was originally silver, but i re-sprayed it badly in the nineties! It's currently waiting for its re-incarnation when it will probably be combined with parts from the Saracen, and re-painted silver again. Mrs Pistonpoppers Muddy Fox Courier Comp... This isn't it! Ta-Daaaaaaaaa... Brand new Muddy Fox Courier Comp! She was chuffed to nuts when i gave it to her on her birthday! She still rides it to this day! Don't know what this is, but i thought the frame was interesting. It's currently stripped to a frame and awaiting some sort of plan of action. The next one should be easy to identify. 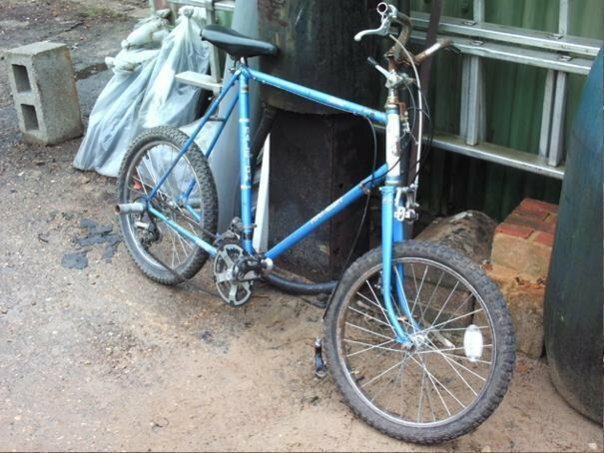 Yep, i'm sure you've realised that were not just looking at the cheap Dunlop Mountain Bike, but the Raleigh Chopper that i found in a bush a year or so ago! Here's the other treasure that was in that bush! 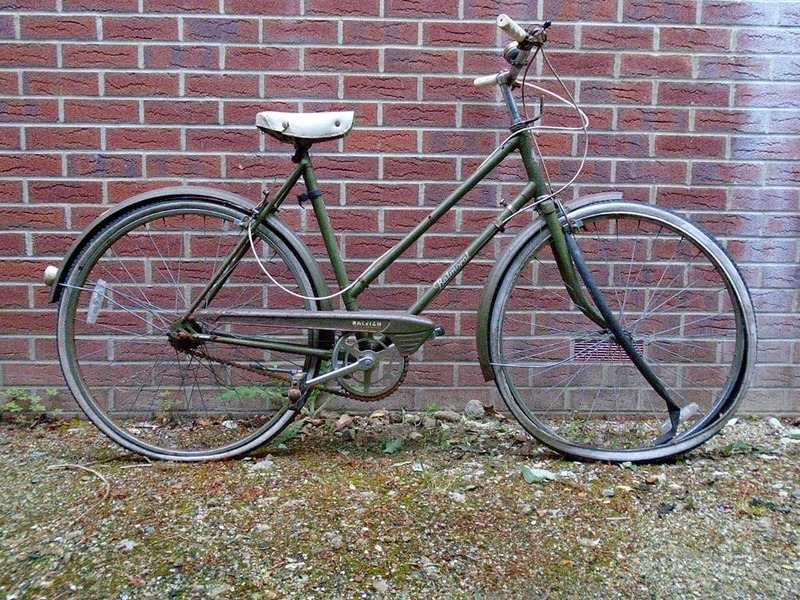 A Raleigh Bomber... Also awaiting it's turn! I've no idea what this is, but i found it down the tip and i liked it, so i had to have it, it's got suspension front and back, and although it is clearly for a child it is just big enough for an adult to ride, although it does look a bit funny. No idea what this is either, i dragged it out of a skip. It has been rattlecanned black and in places it seems to say Volkswagen or something under the paint, but it has a newer Cadillac sticker on top of the paint. Presumably someone wanted to 'upgrade' their bike at some point lol. Anyway, i thought it was interesting, so i dragged it home... Might try to look into what it actually is at some point, then try and restore it! 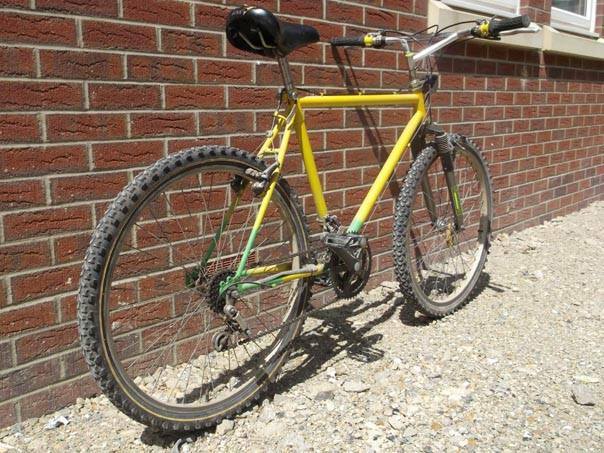 A Murray Mooutain bike from the eighties... 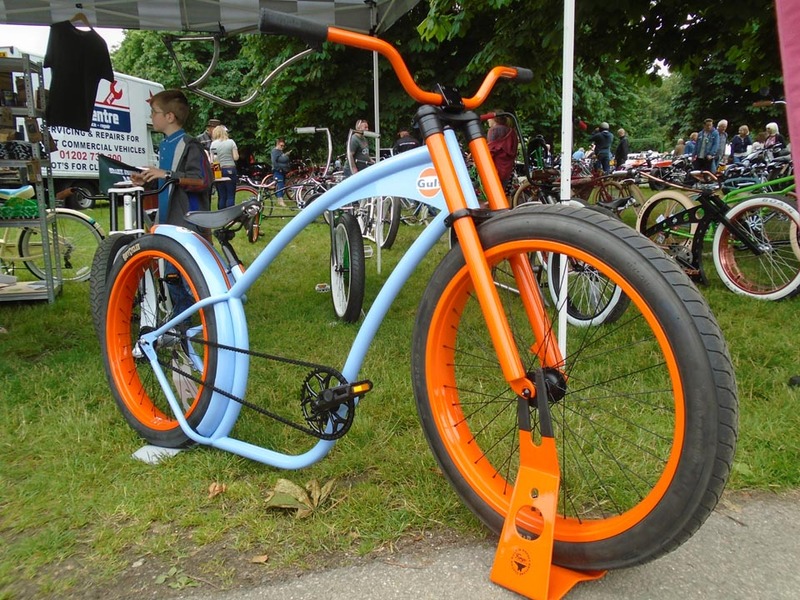 I love the orange tyres, grips, and brake wires! My friend left this with me to look after about thirty five years ago when we were kids. She was an American girl, and her dad worked for IBM. 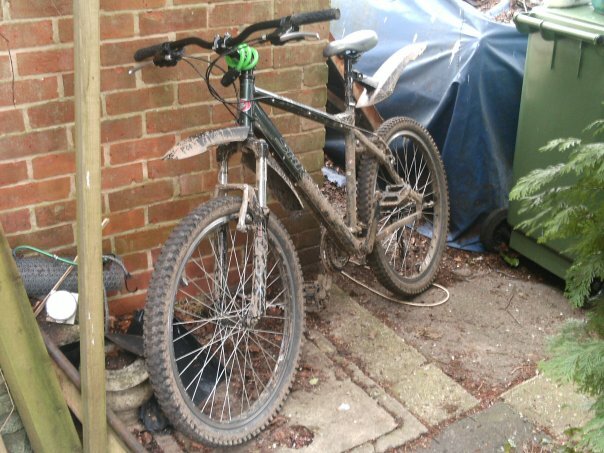 we were playing one day and they were going back to the States for a holiday, so when her Dad picked her up from my folks house, she left the bike in our garage and told me to look after it until she came back. That was around 1981... 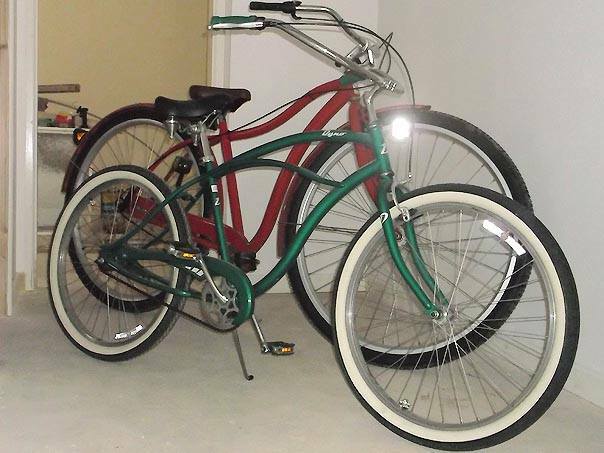 They never came back, and her Dad was transferred to a site in the US, so her bike has been in my folks garage ever since lol! 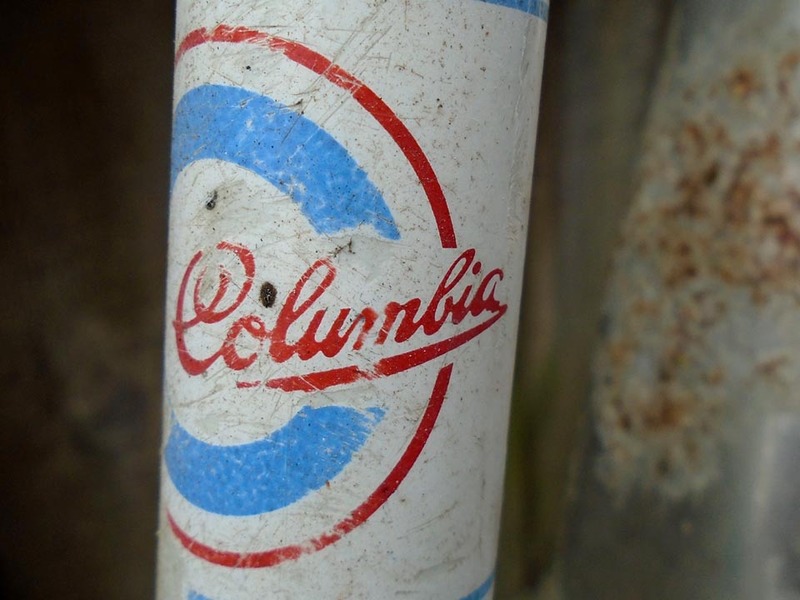 Anyway, it's a Columbia Sports 3, and it's big enough for an adult to ride, and ideally it wants saving, but it probably wont be by me lol. Next up my Coker Monster Cruiser! 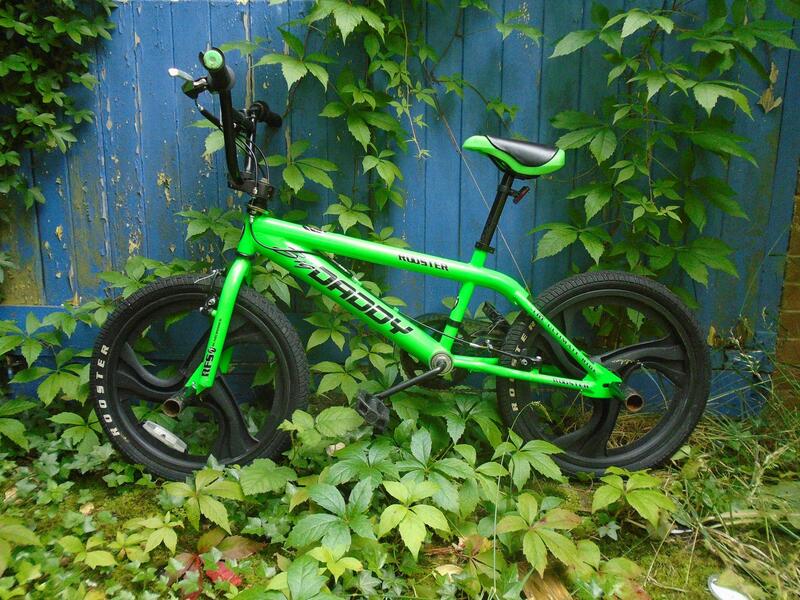 This thing has 36" wheels, and is a lot of fun to ride, but it is quite hard work lol. I brought this in from the USA, and it was ridiculously expensive (for me) to ship here. 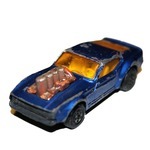 I had originally bought a Dodge Dakota pick up with a truckman type top in the USA. So i bought the Monster, and shiped it to the guy selling the Dodge, and he put it in the back for me! So far the shipping had cost me about $100! When the car shippers turned up to collect the Dodge they said it had to be empty, with nothing in the bed, so they took the bike out, and took the truck! 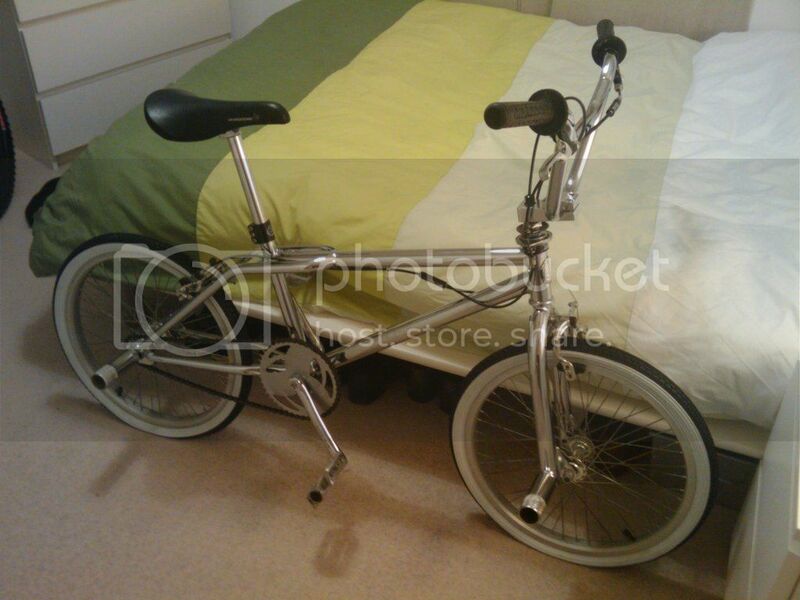 I then had to have the bike shipped to me on it's own £300!! Ouch... Lesson learned! I'll never sell it, because no one will ever want to pay me what it's cost me lol! Here it is next to my Dyno Glide for scale! This brings me quite neatly onto my Dyno Glide! One of my favourite bikes in my collection. 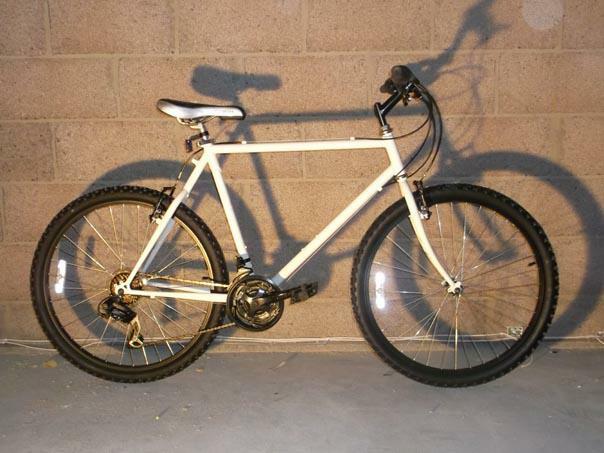 Single speed, but so easy, and comfortable to ride, it's not even very heavy! Lastly, the last bike in my collection that i'm going to write about is this FELT. This photo was taken the day that i got it from the tip! In this photo i have not done anything to it, not even washed it. 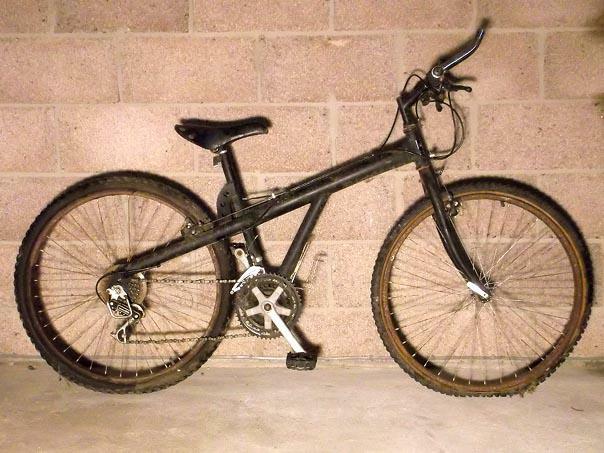 Infact i picked it up from the tip, and rode it home, i don't think it had ever been ridden before, it even still had the bobbly bits on the tyres from where they're injection molded! Who throws this stuff away? 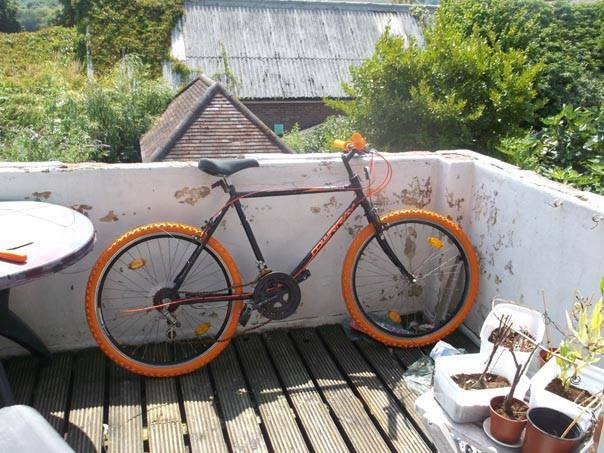 Anyway it cost me a tenner, and the original plan was to sell it after riding it a bit, but it's such a great bike to ride, that current plans are to replace the tyres with road tyres as most of my riding is on paved areas, and then just keep riding it! Anyway, what do you reckon gang? Is this worth reading, and updating as i go? 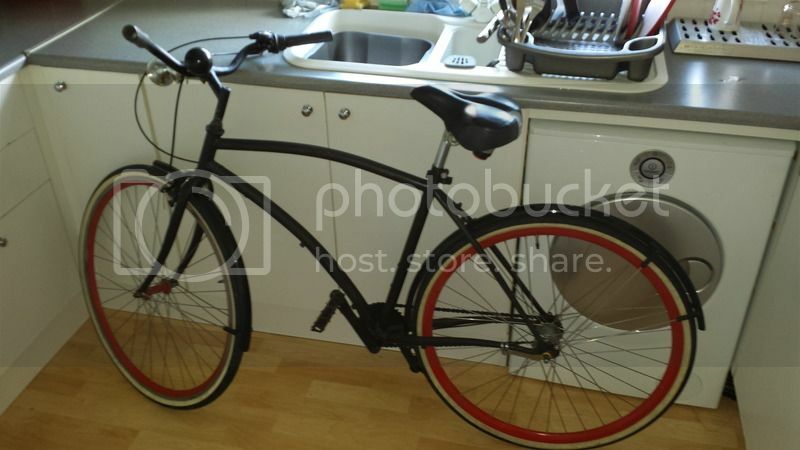 Also, if it is, from this point on i will start to include other bikes that i have, that may, or may not be up for grabs, so if you see anything you fancy do please feel free to let me know. Glad to see I'm not alone! 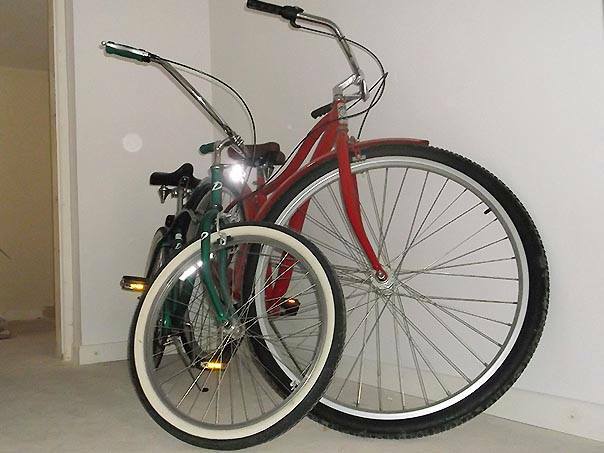 I've had hundreds of bicycles over the 25 years or so I've been playing with them. 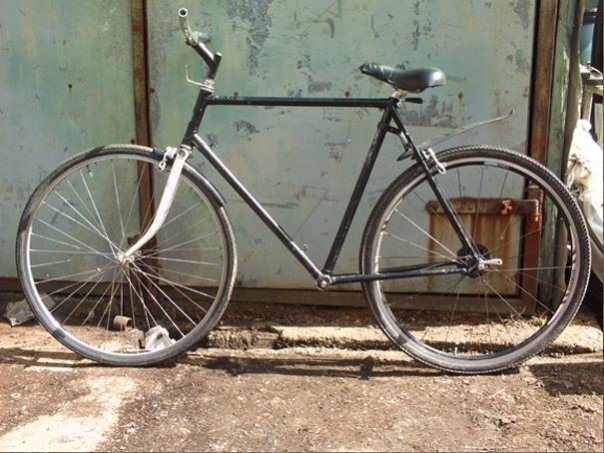 Gave away/ sold about 50 bikes last year, currently about 25-30 left and for the first time in my life more working bikes than bikes that need work! Keep up the good work. I'm not too much for the bikes but I do appreciate a goodun. Here's a shoddy picture of mine. No idea what it was, cheap as frame with some nice bits on it, bought it from some chap out of his garage in Newquay several years ago. 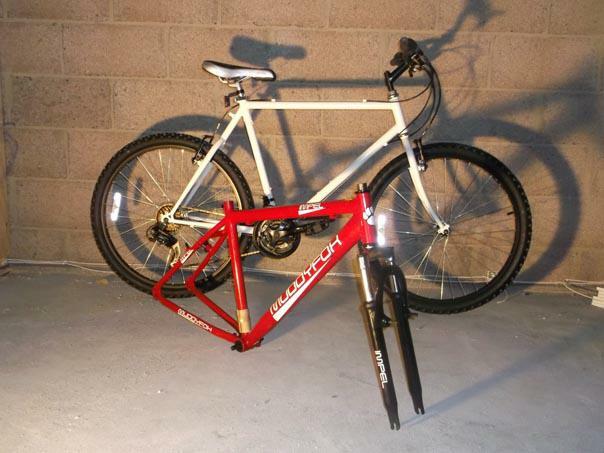 I've got bikes as well, I kept my BMX bikes from back in the 80's, I am custodian of my late grandfathers racing bike and having children gives me the excuse to build bikes for them rather than buy new ones from Halfords. The motocross/chopper style bikes look interesting, no idea what they are though. Definitely interesting thread. 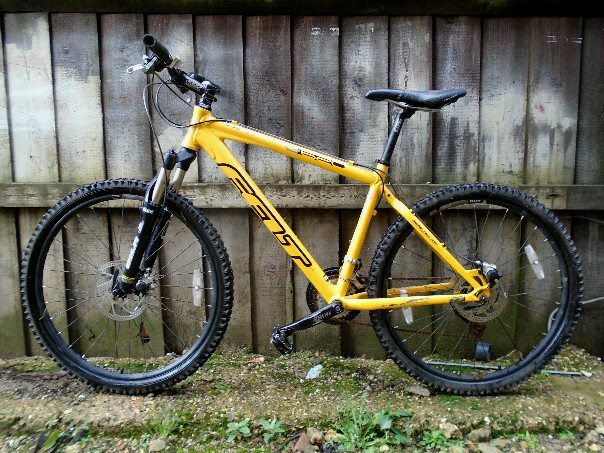 I was never much into bikes until I took a job managing a Halfords bikehut (selling things like your Mantis) and building some of the nicer ones. I ended up building several bikes for myself and others, and although I don't ride anymore - just no time - I still get a strange peaceful satisfaction from working on one. I rebuilt a couple of Schwinns for a lady I know a couple of years ago which was a bit of a challenge. Anyway waiting to see what else you've got - some of the more unusual stuff baffles me - those little suspension bikes especially, never seen anything like that before. 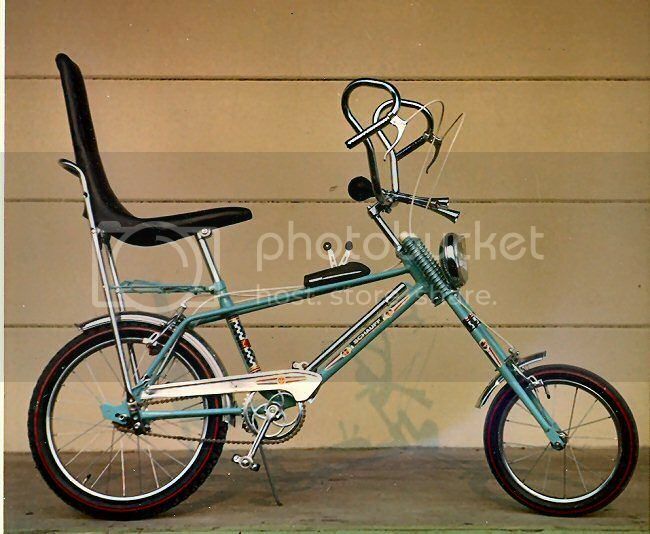 If you type in Schauff Bonanza into google it brings up all sorts of versions of their chopper style bikes, thats me busy for the next couple of hours ! Not the same model as yours but I had to put it up here. Hopefully you noticed that the Columbia Sports 3 is ever so slightly different to the others... Did you guess which thing was not like the others? Did you guess which thing just doesn't belong? If you guessed this one is not like the others. Then you're absolutely... Right! 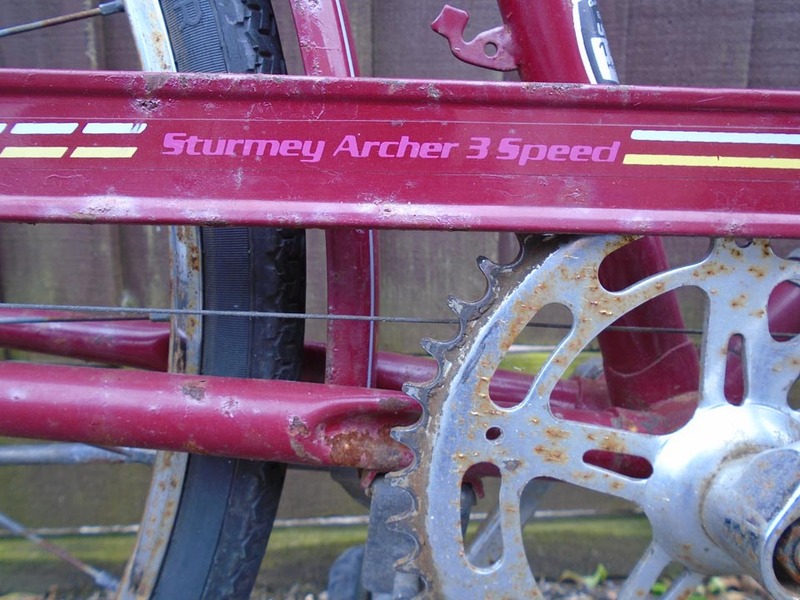 Oh dear... See, i told you that the sound of that Sturmey Archer rear hub takes me back to my childhood! 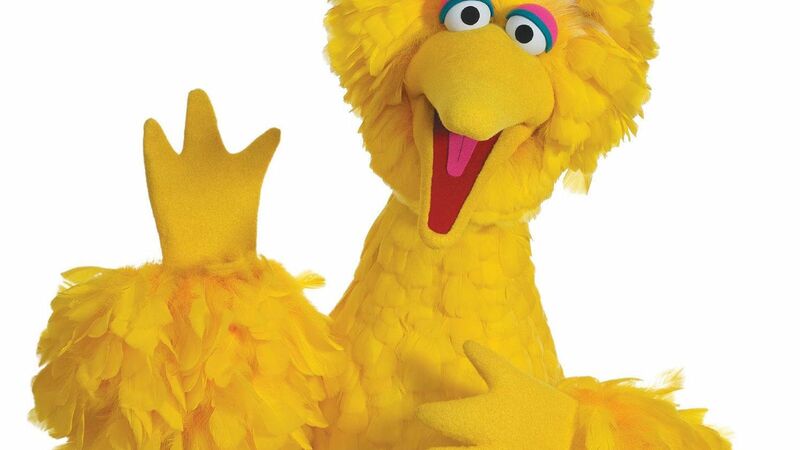 But anyway, enough of Big Bird and Sesame Street, let's me tell you a bit about the Columbia Sports 3. A long time ago, when i was about 13 or 14 years old i had this friend, well she was an American girl, raised on promises... She lived near the street where i lived, and often we played together, riding her bikes, like kids of the early eighties used to do. (is it just me, or do kids just not go out riding anymore? when i was a kid there was always hoards of us roaming the streets endlessly on our bikes etc.) One day at the beginning of the summer holiday we were playing in the street on our bikes when her Dad pulled up in his car to take her home. They were going on holiday, well, vacation as she would say, back to the USA where they came from to see their family for the duration of the six week summer holiday. 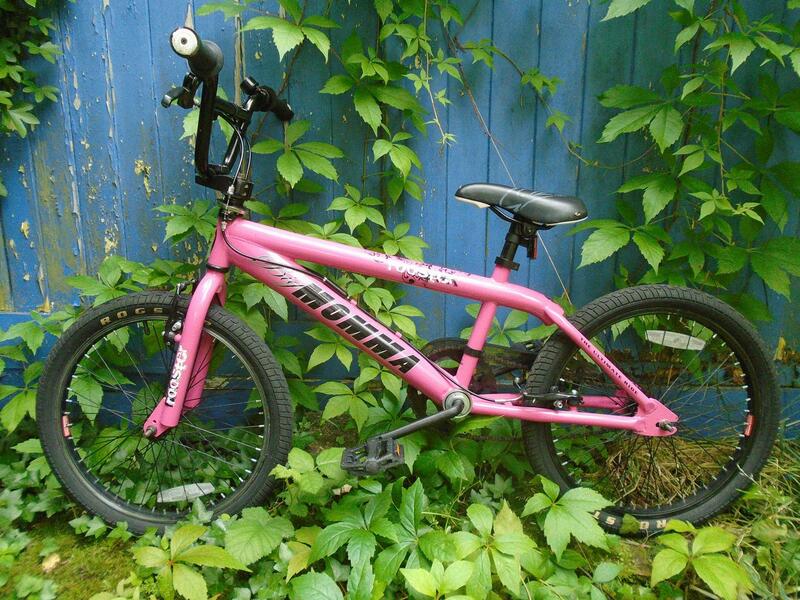 She asked me to look after her bike until she came back at the end of the summer holiday. OK i said, and put her bike into my folks garage. And that was it... I never saw her again. Her Dad worked for IBM, and while they were back home they transferred him to a place in the USA near where they came from, which i guess was fair enough, but i don't think she ever knew she was going home to stay, otherwise she would've taken her bike home, it was kind of her pride and joy! 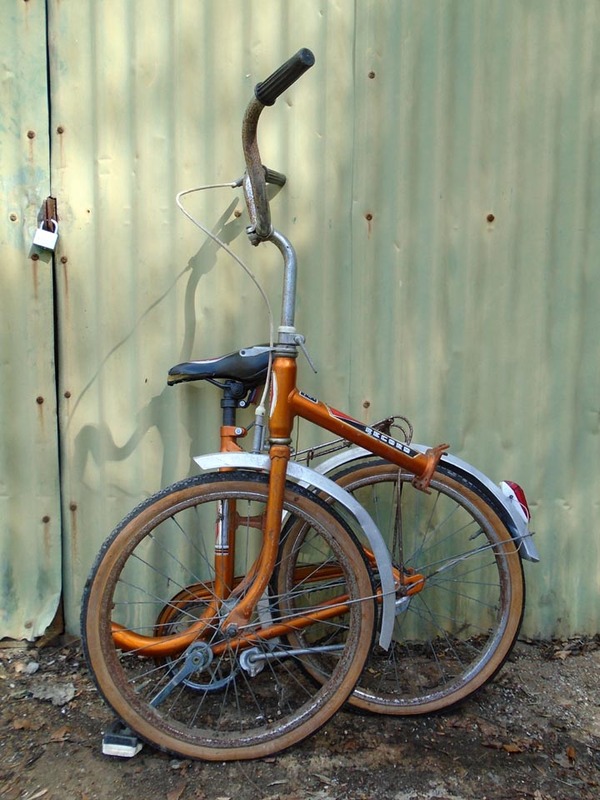 She had done a few mods like flipping the handlebars over, and cutting down the mudgaurds to make an almost Café Racer style bicycle, and as i remember it rode pretty well, it has a steel 19" frame. 26" wheels, like the other three, thats not 26" like a mountain bike, it's old style 26" wheels, but also has a 3 speed hub (although not Sturmey Archer). 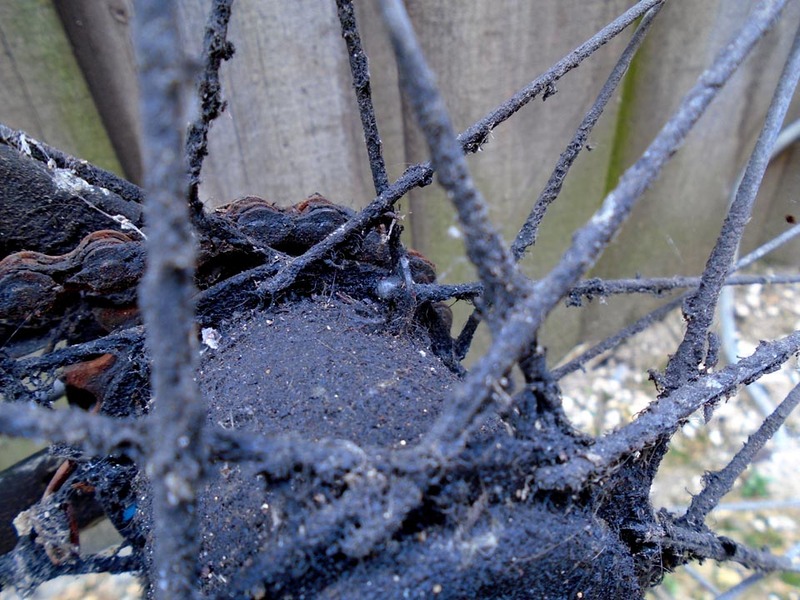 Look at that, that's the best part of forty years of crud on that rear 3 speed hub! I do wonder how it got like that just sitting in the back of my folks garage since about 1981! 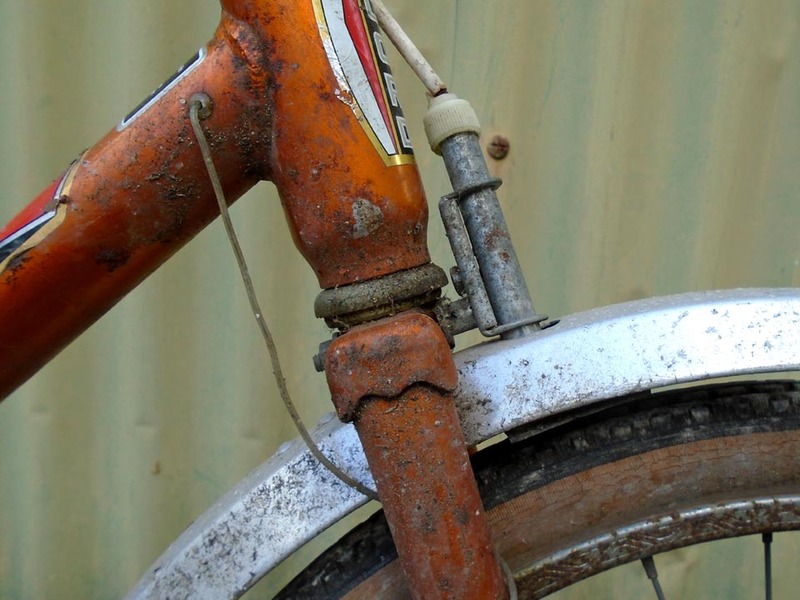 Undoubtedly there would've been some crud on it when it went in, but i don't remember it ever being caked like this, infact i remember her bike was always spotless! It also features a dynamo light set, which as i remember was pretty bright, however by todays standards it would probably look like a candle glowing away behind the lenses! I always thought that this was a cool little bike, and like i said i have kept it in my folks garage since she left, i'm guessing that after 31 years she's probably not coming back for it, and to be honest i had forgotten all about it until we were having a bit of a clear out of my folks garage about a year ago, and suddenly there it was! Funny thing is, my Dad looked at it completely surprised and said whos is that? I said, it's Renée's. He said, why is it here? I said, i'm looking after it for her! There was a long pause and Dad finally said, when did she leave it? 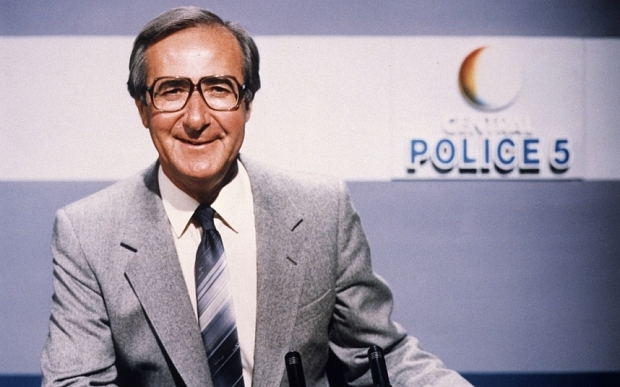 Oh, i said... About 1981?! I'm guessing she's probably got a new one by now though! And so, after hanging on to it for another year or two since re-discovering it, i have decided to sell it. I havn't asked her permission, because i've no idea where she is... It's been 35+ years, so i'm guessing she's letting me keep it lol! 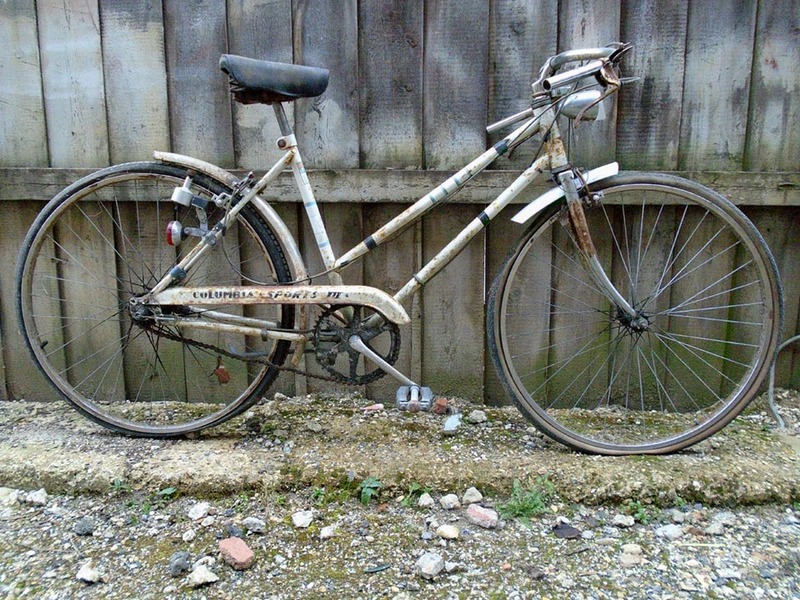 But Renée, if you're out there and want your bike back, it's ebay item# 152112205641, and you'll get four bikes for the price of one! One more thing while i've got your attention. 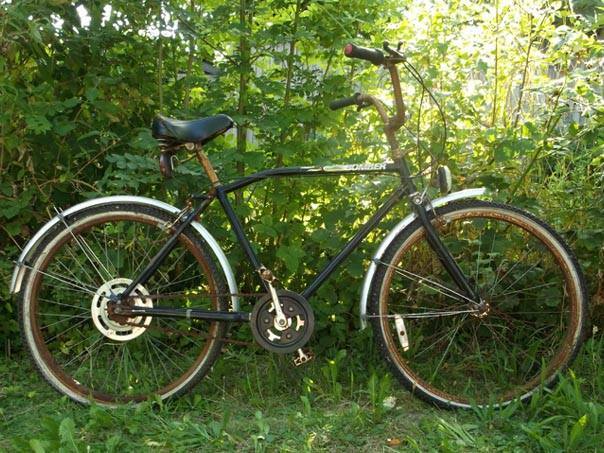 In my first post about my bikes i mentioned Mrs Pistonpoppers Muddyfox Courier Comp that i restored/modified for her. Well the other day she came home from work, and parked it down our drive alongside the house, by our front door. However, it was obviously not parked far enough down our drive, and someone rode off with it at about 17:00hrs on Friday evening! 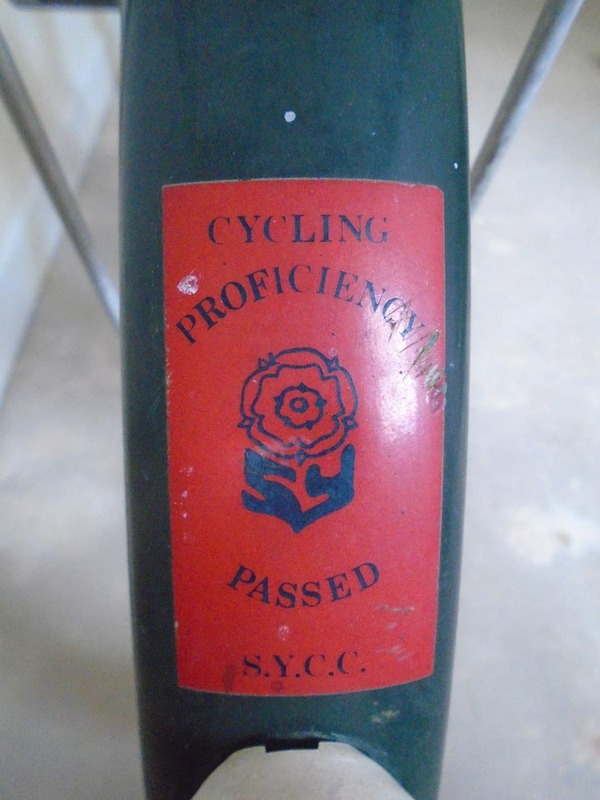 It goes without saying that she is pretty urinated off about this as she's had the bike since she was in her late teens, and after i'd played with it a bit it was like a new bike, infact, apart form the frame, it was new. I'm guessing it's long gone by now, but if anyone should see it, please do let me know, it's not like any other Muddyfox Courier Comp, it's white, got black wheels, and now sports rather fetching Muddyfox Courier Comp decals in a rather leary shade of pink! Er with my currently growing BMX collection! But all seems well with the Muddy Fox, except it would appear to have lost its front light, oh well, every silver lining has it's cloud! 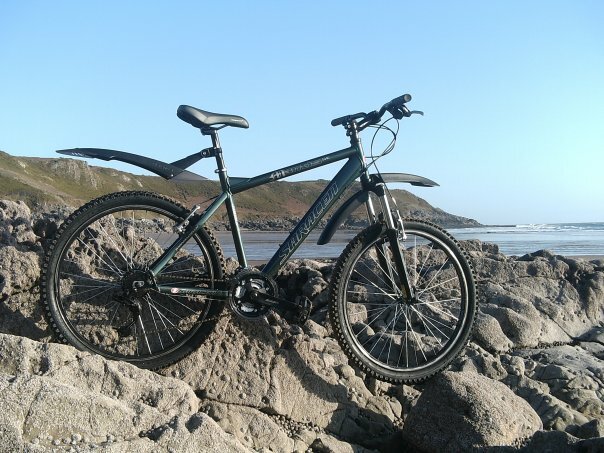 Mrs Pp is chuffed to nuts about having her bike back, we both thought that we'd never see it again, infact i have been trying to buy another on the bay of E to build another one for her, but kept getting outbid, looks like that was for the best now! The thing is though, when i snipped the lock i made no secret of it, it was pretty busy and crowded, but no one said anything, it was almost like i was invisable, which being quite a big fat fella believe me i am very easy to see lol. I put the lock in the bin that was by the fella sitting on the bench, and even he didn't say anything, he just watched. 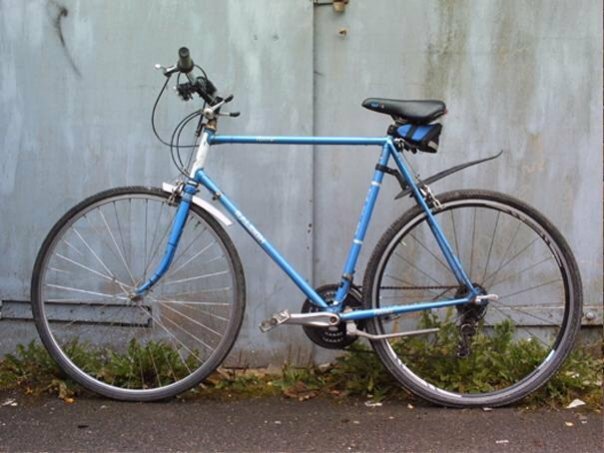 Of course as i sit here and write this i am hoping that i have just re-taken the bike from the person who took it from us, and not stolen it from someone who had bought it from the person who stole it from us! It was kind of a knee jerk reaction, we knew the bike was the one we were looking for because i had built it in a way that made it different to every Muddy Fox Courier Comp, so to us it was easily recogniseable, and without a doubt the bike we were looking for. What would you guys have done if this had happened to you? Should have got his mugshot on camera phone and posted with a "thanks for keeping an eye on my partners stolen pushbike" hashtag on facetube twatter or some such. It's your property even if someone has bought it in good faith, which they didn't," Muddy Fox, Yeah mate 30 quid to you it's pukka no problem i just don't use it any more........"
You did the right thing, if it was yours why shouldn't you take it back? Good, i'm glad to see that we all agree that the vigilante approach is the right approach! It's good to know i'm in good company! 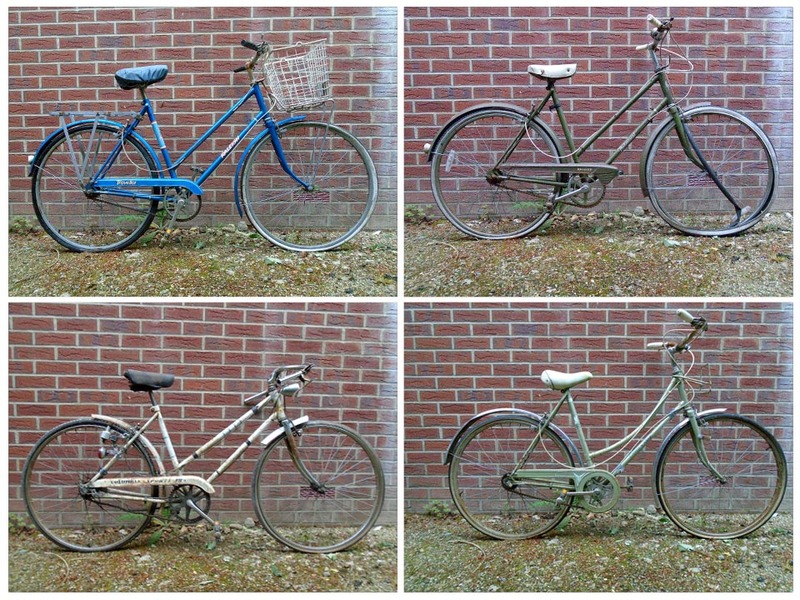 Now tonights episode i want to talk about some bikes i dragged out of skips on the roadside. I'm going to start with this thing, adn honestly, THING is the right term to use! 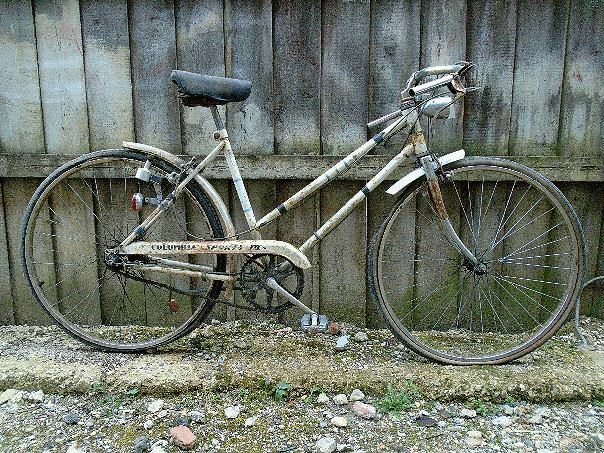 I dragged it out of a skip, and after riding it the mile and a half back home to Pistonpopper towers i could genuinely see why it was in the skip, it rode horribly! Atfirst i couldn't work out why it was so horrible to ride. I faffed around with the seat, and the handlebars, but i could never get them in a position where it was comfortable to ride. The whole time i felt like i was perched on the handlebars when i was riding it, and not sitting on the seat! It was an odd riding experience, and every time i tried to ride it i felt like at any moment i would be going of the handlebars! 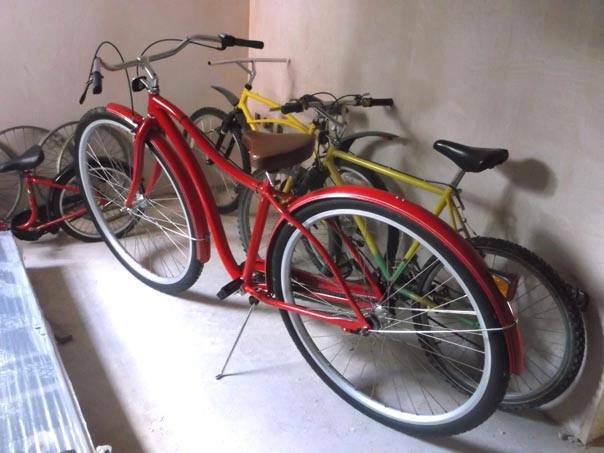 I couldn't work out what was wrong, until i parked it next to my other bikes of a similar style, and suddenly it was obvious. The frame was 2" shorter that all my other bikes, now i know that 2" doesn't sound a lot, but according to Mrs Pistonpopper an extra 2" can make all the difference to your ride! I've no idea what she's on about, so i guess i'll just leave it there! 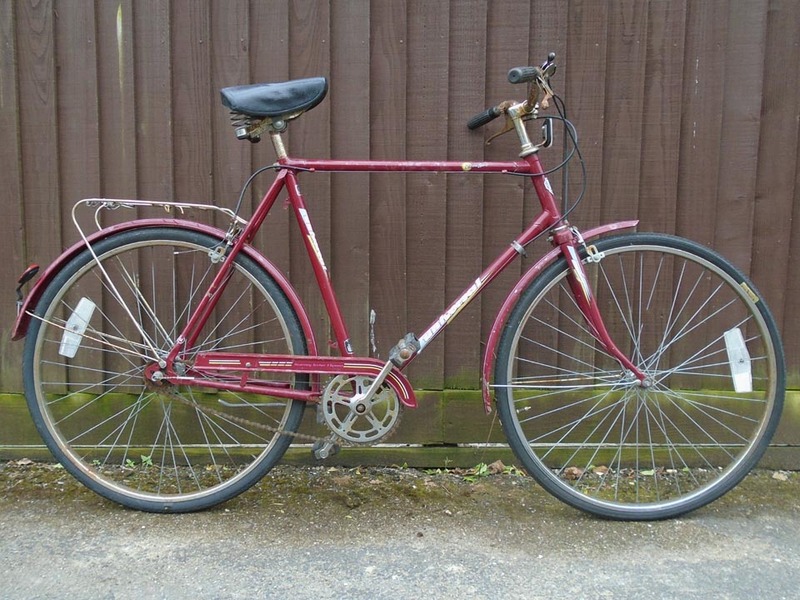 The one and only good thing about this bike was that it was equipped with a Sturmey Archer three speed hub, and therefore it made that lovely tick-tick-ticking sound as you rode it, i love that sound, it's the sound of my youth! Anyway, as luck would have it i managed to find someone who wanted this thing to build a racer from, so i let him have it, and i wish him all the best with the damn thing lol! The next two bikes i found both in the same skip, and they were both of the Shopping variety. 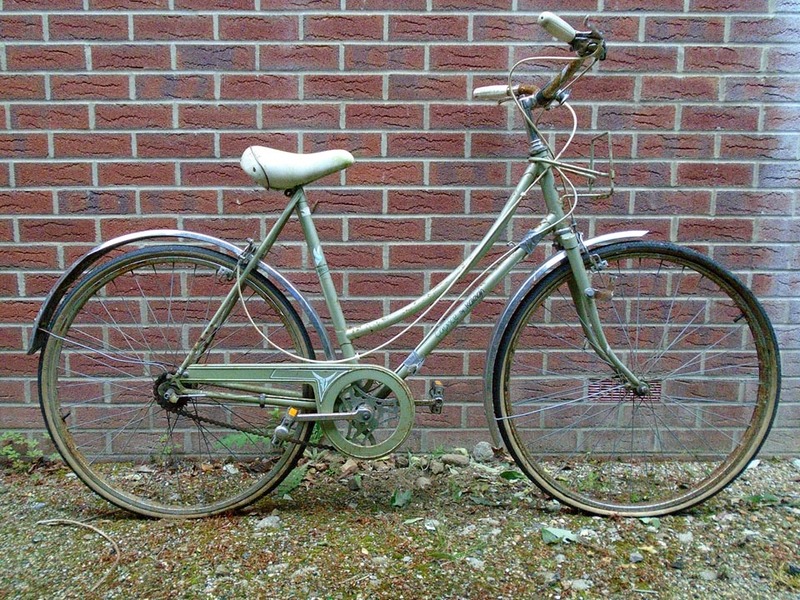 First up, this Raleigh Twenty. Now for me i always dismissed these bikes, and indeed this type of bike when i were a lad, but times have changed, and these days when i see old shopping bikes i reckon they look pretty cool. 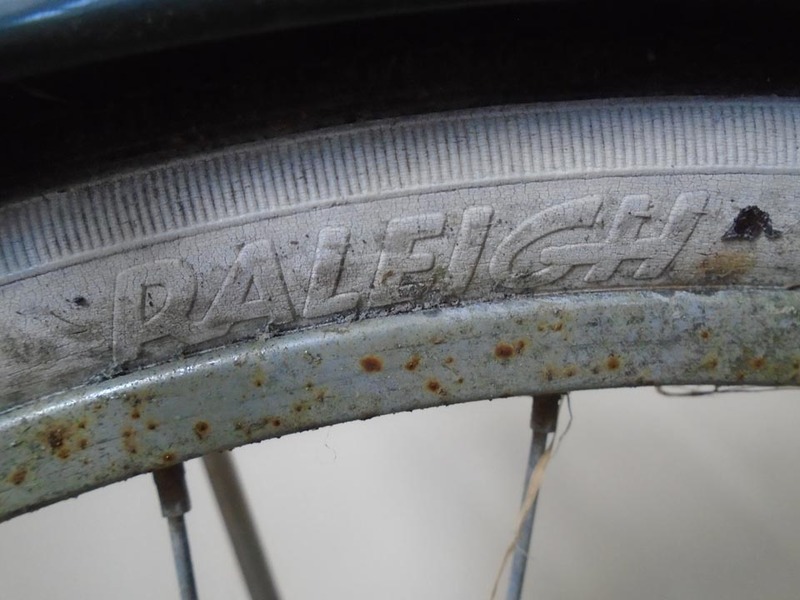 I'm guessing that this thing was original right down to the tyres on it, which i reckon were probably getting on for thirty or forty years old, and flat. However after installing some new air into them i was off, and it was rideable! The back brake cable was siezed solid, but apart from that everything workd as it should! 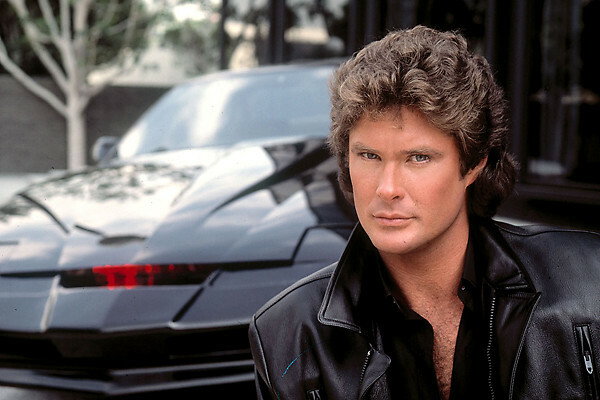 Hmm... Actually, lets not do that, i don't have the perm! But anyway the lights were Marchal lights, and even though they were a bit grubby on the inside they worked ok. 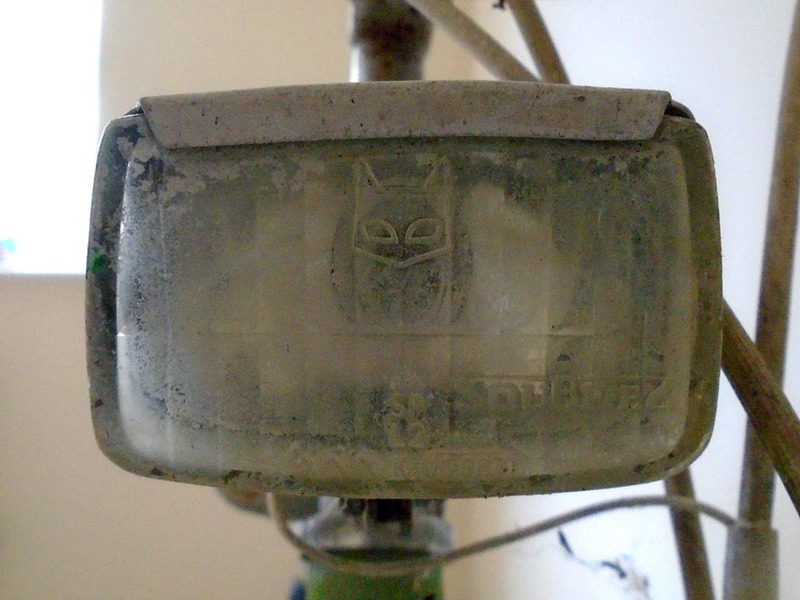 I never realised that Marchal made lights for bikes, when i was a kid there were basically two kinds of lights, Ever Ready, or Wonder Lights. 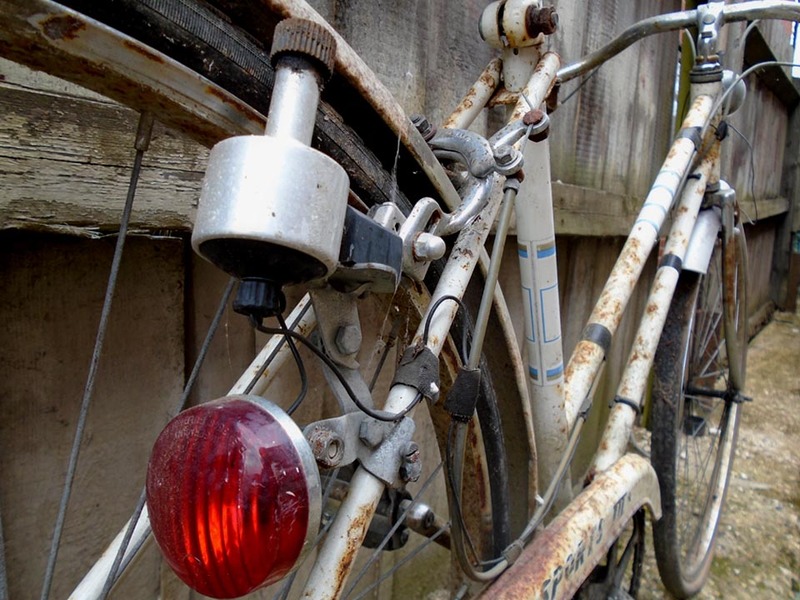 Although having said that i wasn not a big inspector of bike lights, i just wanted to ride the things! 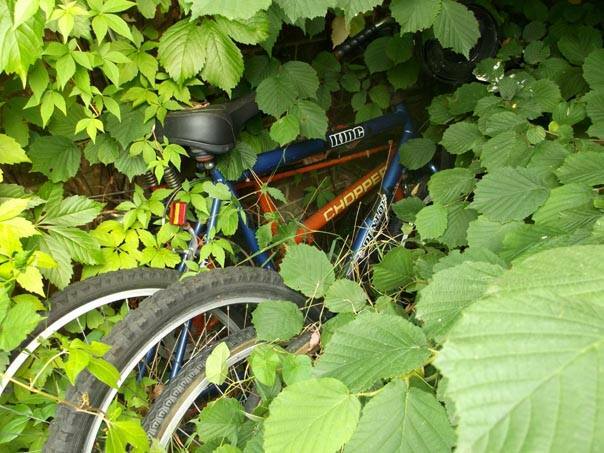 The good news is that whoever originally owned this bike did actually manage to pass their Cylcling Proficiency! I wonder why they don't do that at schools anymore. 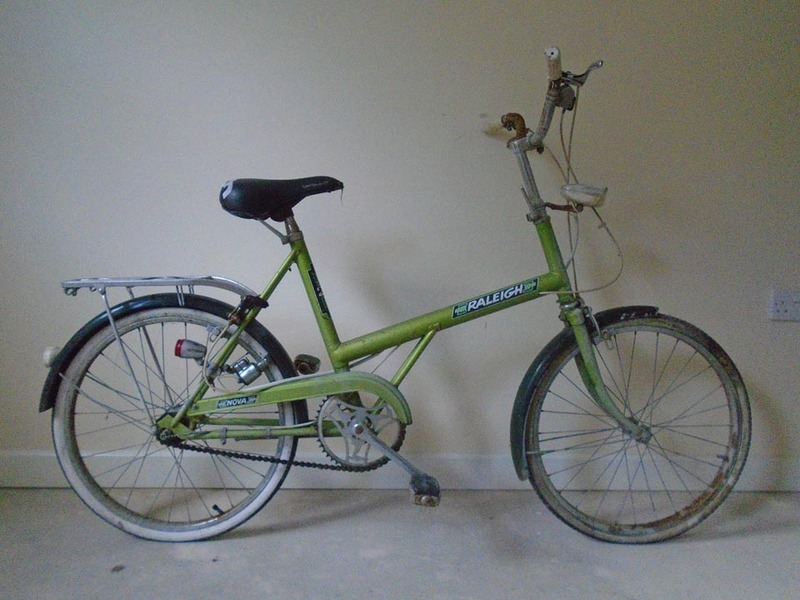 The other shopping bike i pulled out of the skip was a folding(ish) type bike called a Record. This had some quite unique features. I quite liked the two tone pedals for a start. 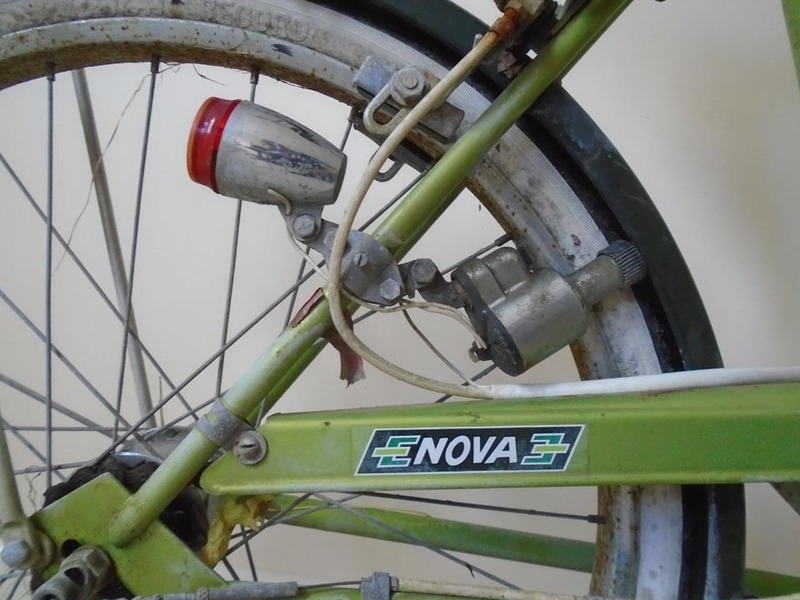 Although it was only a single speed maching the coaster brake was quite cool, however the front brake left a lot to be desired. it was more a bike of two halves, and the minute i showed people how to fold it i was met with a fair bit of, er, no thanks mate! I think i should've hung on to this really, but you can't keep them all, and so sadly it is probably masquerading as a baked bean tin now in the supermarket! Nevermind... I'll keep the next one, except that this is the first bike of this kind that i've seen, so the next one should be along when i'm about 92! In other news. 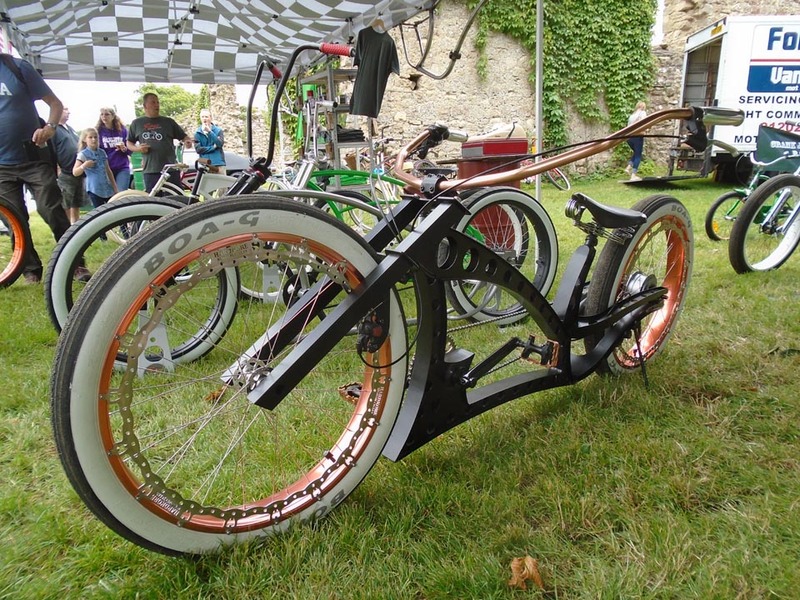 I went to a car show recently, and as has become popular there were a few cool bicycles in attendence too, here's a few of the ones i liked! 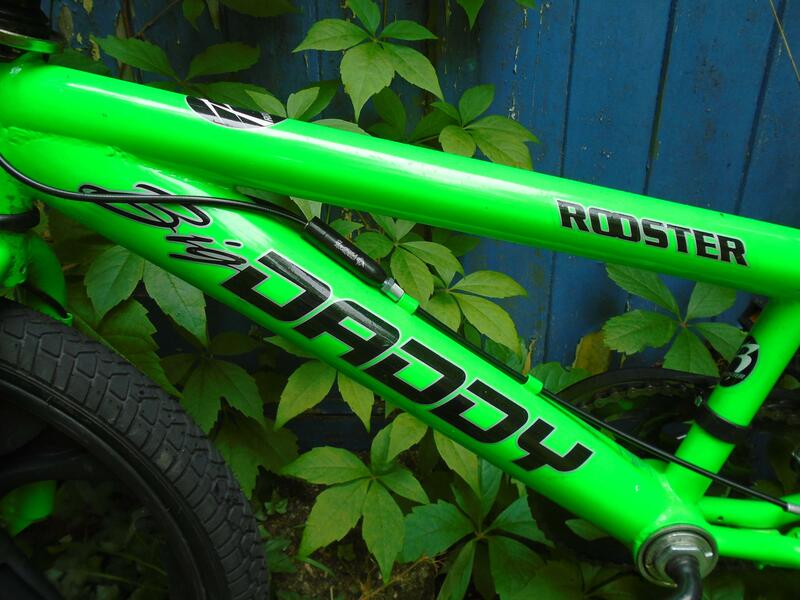 Cool as these last two look, i have to wonder if they are any good to ride? And i do love a good skip/clearance rescue.. I'll stop cluttering up your thread now, but keep up the good work. 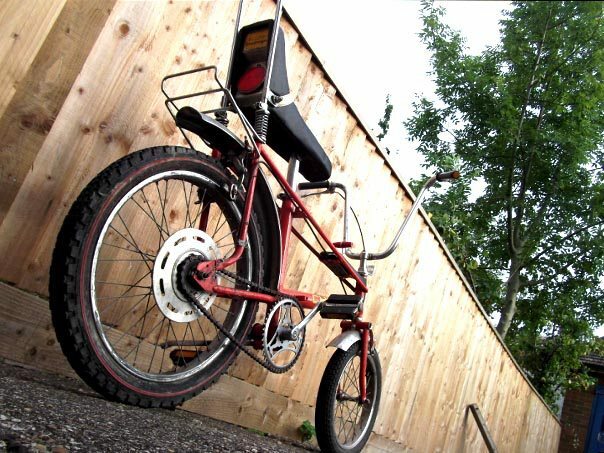 I'd say that they're all less than ten years old, but the plan is that Me, mrs Pistonpopper, and the Pistonpoppets are going to get four of the ten BMX's i've got up together, and then use them to ride throughout the summer holiday. 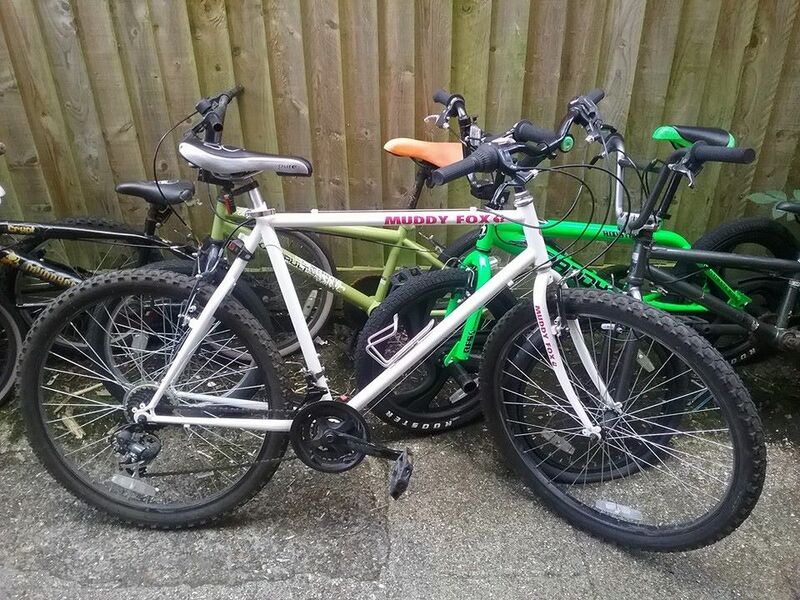 I've bought them simply because i can easily get four BMX's in the back of my pick up, but not four mountain bikes. And we can all ride these, they're small enough for our smallest child when the seat is dropped right rown and the handlebars are slightly laid back, and they're big enough for me at 5' 10" when the seat is raised right up, and the handlebars are tilted slightly forward... On size fits all lol! 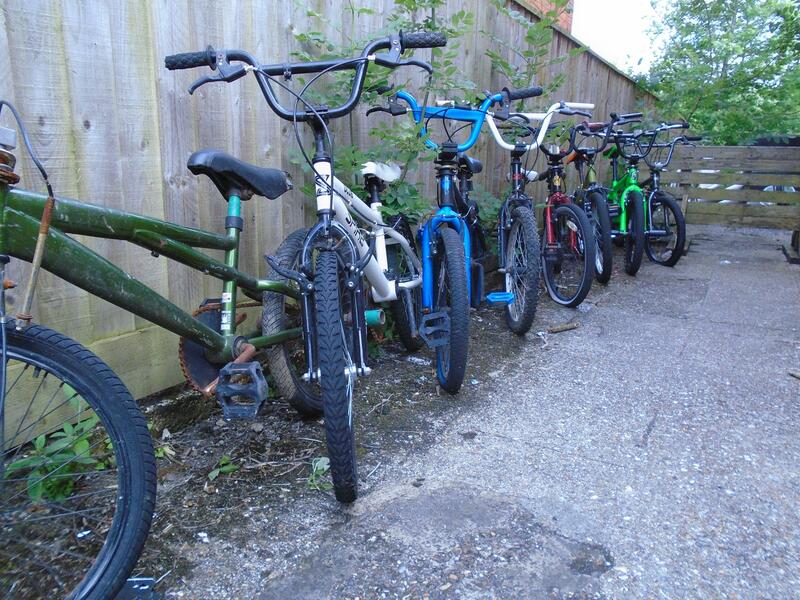 Of course this does mean that six of them will be surplus, so if anyone wants to buy a BMX let me know lol! 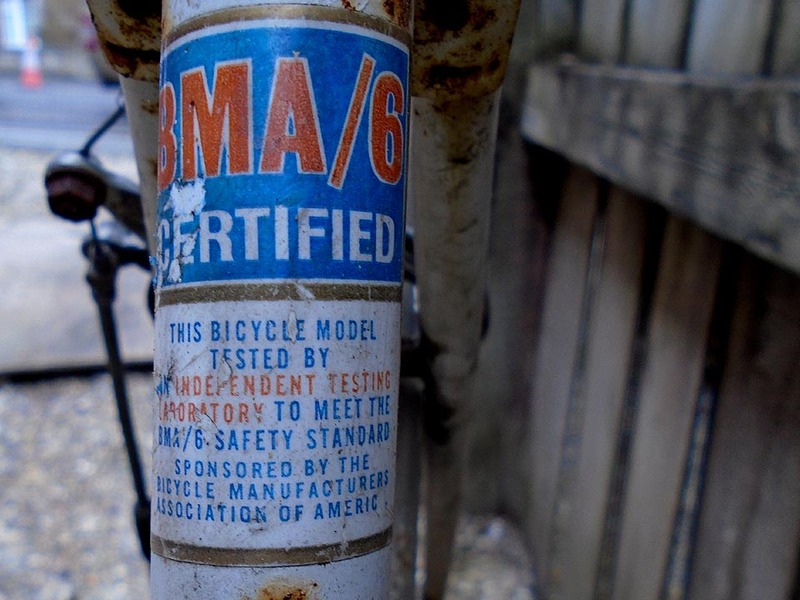 Sorry I digress, The stickers for most old bikes seem to be reproduced or available somewhere with the aid of your favourite search engine. 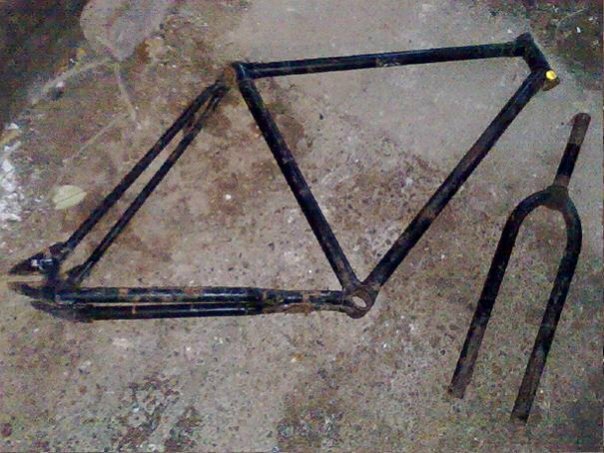 And what started out a bit of a quick project to build a pub bike got a bit carried away when i got my mate G involved who is a fountain of BMX Knowledge, so all the parts are correct and/or period correct for a 1982 Skyway, so if i ever find the correct frame for a decent price I can do a proper rebuild. 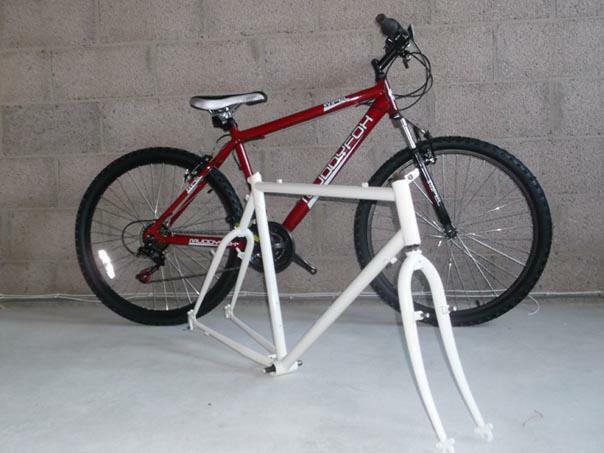 So it cost more than it should to make it rideable (I think the genuine wheels being the costliest) but all in not a great deal (I think the powder coating was £15...) Nowhere near you friends price at any rate. But for now it serves for the 10min trip to the pub on sunny days, though anymore would be a bit much as i'm 6ft and it gets a bit uncomfy without the promise of beer or it post suppage pain killing qualities. 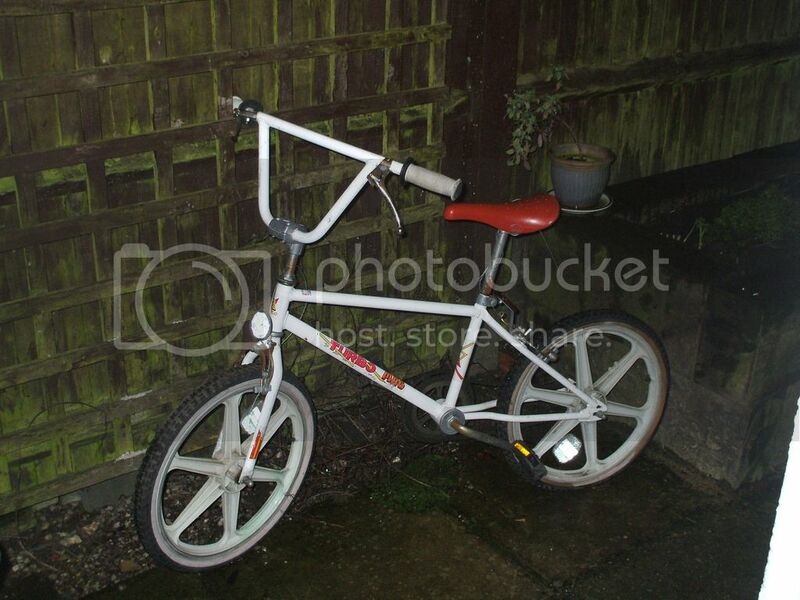 I also aquired a early 90's pair of BMX's off a colleague for a few beer tokens, almost the same day after he saw me loading the apollo into the back of the then co. car. They were a little bit grubby from residing in a garage for over a decade but came up well. 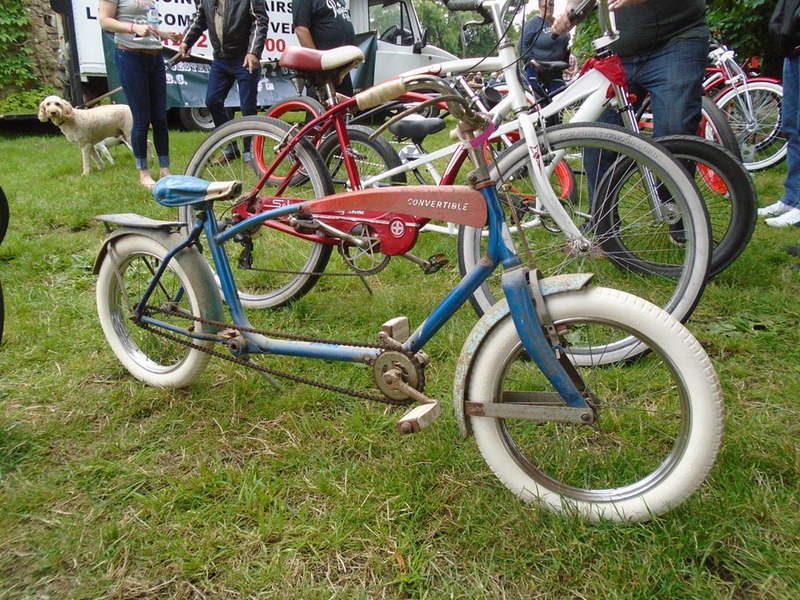 The mongoose went to G who then re-incarnated it into the 'Bongoose' with white walls and lots of Chrome. 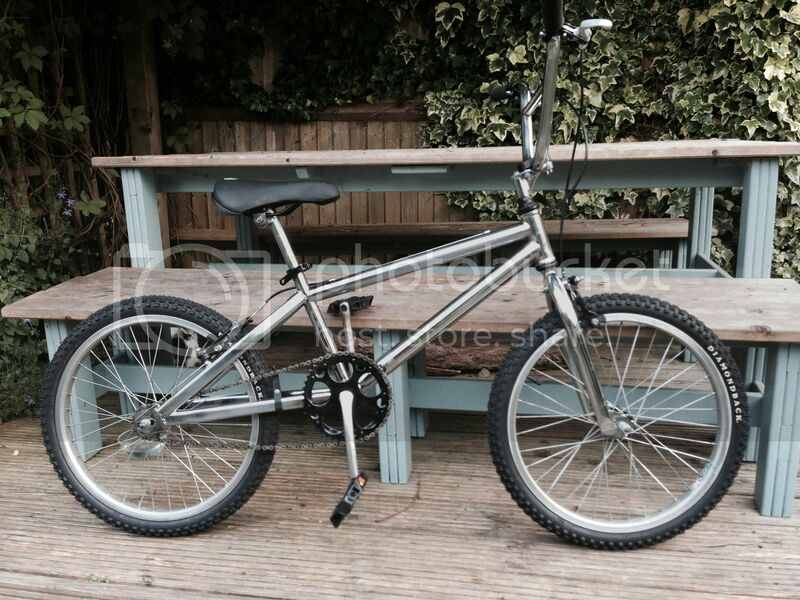 I also did a mini chrome for my nephew who loves his bmx'ing for his 8th birthday, from a local £5 ebay special, with spares i had and a few internet bargains thrown in. Indeed my tribulations on fleabay do continue jpr1977 The funny thing is that i never had any trouble selling anything right up until i sold that Ranger to those gipsys! From there on in, nothing but trouble. To be honest you don't want to get yourself a L200 for your dog car, you need a Chev-suzu... My Chev-suzu to be more precise lol! 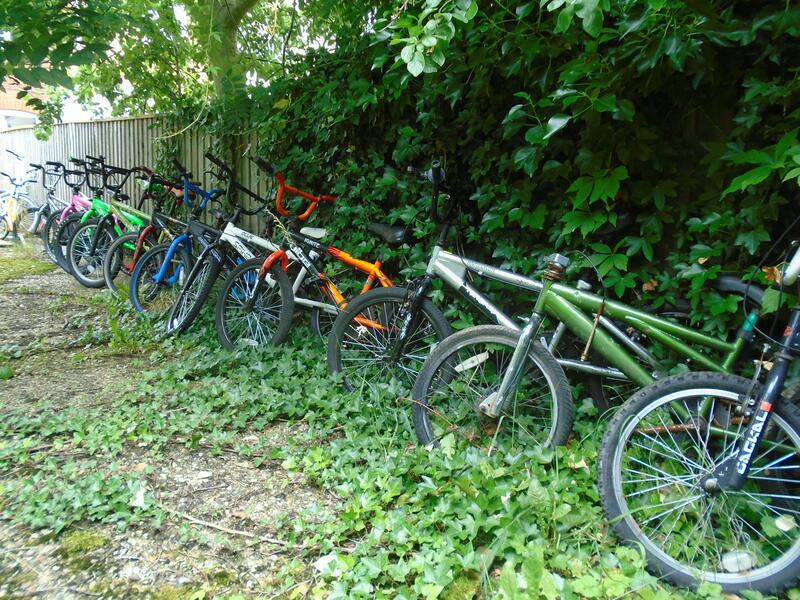 Anyway, thats a pretty nice collection of old school BMX's, i'm guessing that as none of them have the frame brace up by the head that they're all of mid to late nineties vintage? 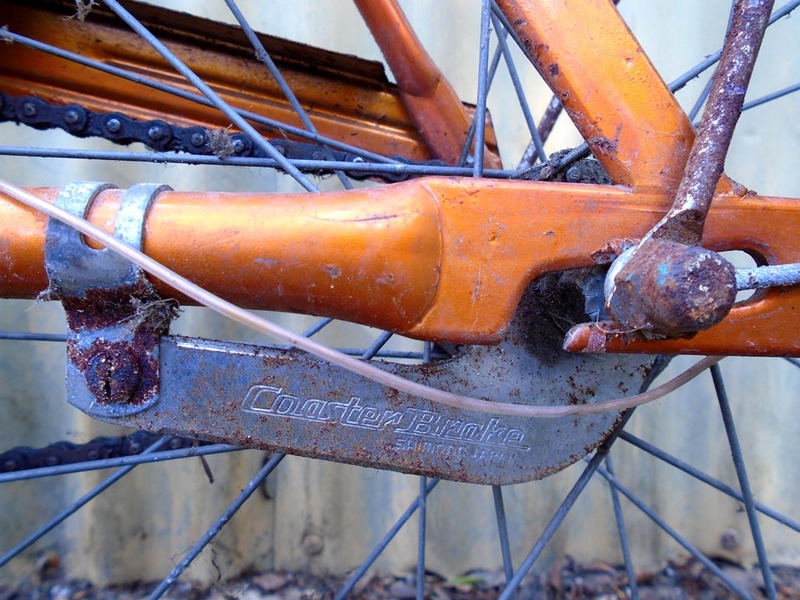 I'm not much good at dating bikes, but as i remember the eighties BMX's always had some sort of frame brace. 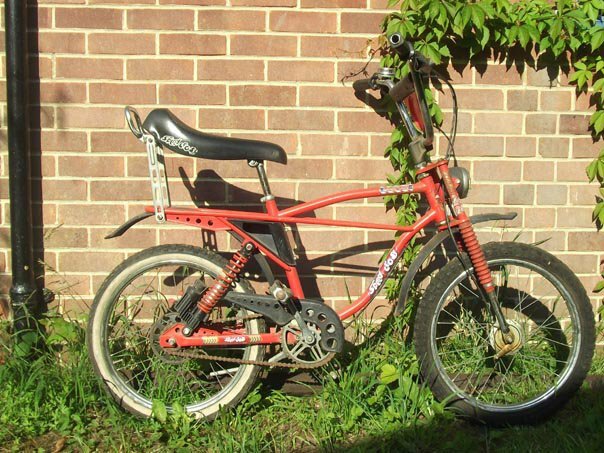 The more i look at your Skyway bike, and for that matter the Mongoose, the more i think i need to get an earlier BMX, they look very cool indeed. 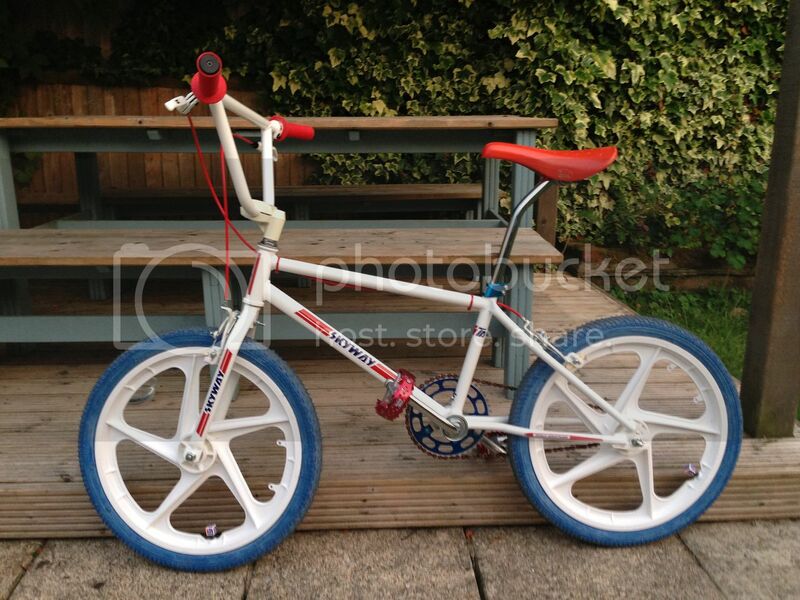 My BMX collection has once again grown... By one, so i'm up to eleven now. Ahem. This is becoming more out of hand than my car collection... Nearly! The reason for the large amount of BMX's is so that we can have one each as four will fit in the back of my pick up, we can then head out to the beach, or whatever, and just blatt about on them during the summer holidays. Well, thats the plan. 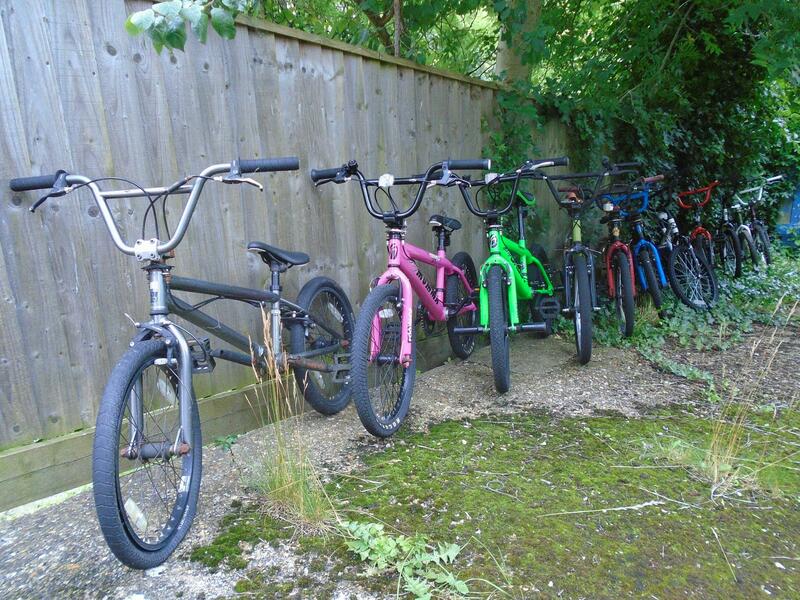 So out of the eleven BMX's we are going to pick the best bits, and make four bikes for ourselves. Frankly if i can't build four good bikes out of eleven very useable bikes i'm on the wrong forum, and have no place being here! A Rooster Big Momma!! Superb, i couldn't believe my luck, and better yet, it was close, just 26 miles from Pistonppper towers! 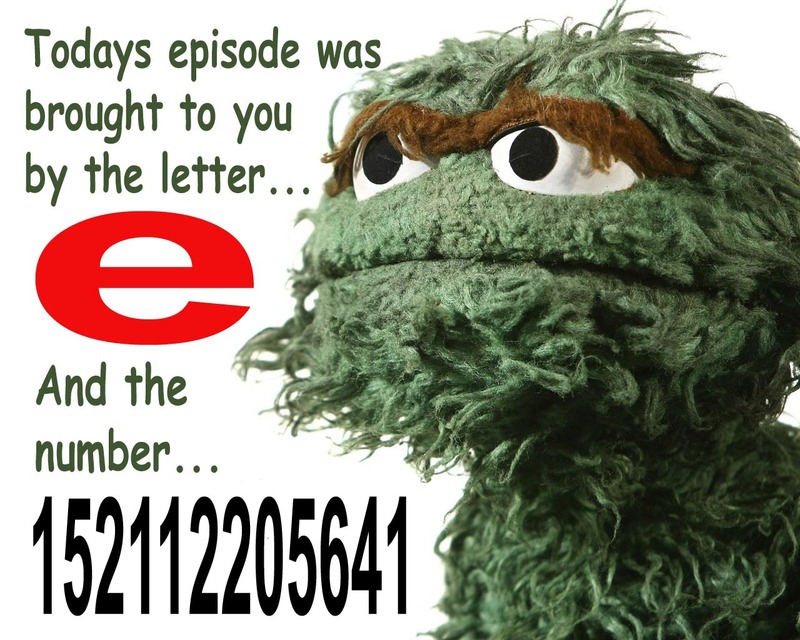 So... I bought it, and went to collect it straight away! 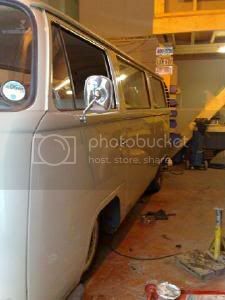 As it happens, the day i bought it and went to collect it was the same day as my eldest Pistonpoppets school barbeque, something that we all had to attend! Mrs Pp was a bit upset that i would be running late, as i told her that i had to collect something before i got home. She was less upset when i told her that the thing that i had to collect, was infact a gift for her! So off i went to collect it. When i arrived to the barbeque Mrs Pp was sitting at a table with a lot of the other parents, and as i walked up to them she shouts out, "Hey BIG DADDY!" The other parents who were sitting at the table, all chuckled! I just sucked it up and said "Hey!" Then Mrs Pp said to me, "So where is it then?" I said, "where's what?" She said, "My gift that you were going to get, the thing thats made you late for this!" I said, "Oh, It's in the truck." Mrs Pp said, "Well, go get it, i want to see what was so important that you had to get it tonight!" this was followed by the other parents at the table all telling me that i needed to get it, as they wanted to see it too. So i went to get it out of the truck, and rode it in. As i pulled up next to the table (with a skid i might add!) 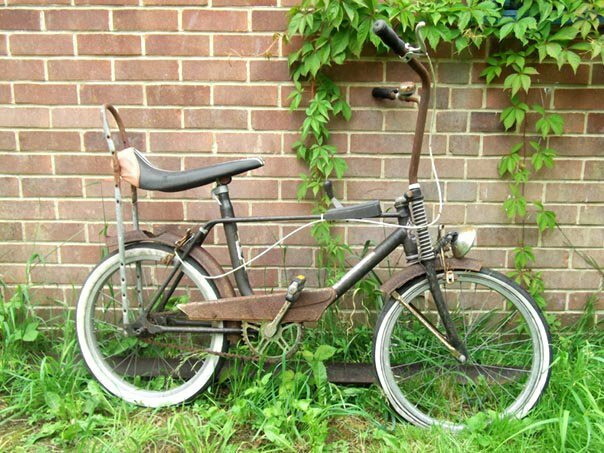 I said to Mrs Pistonpopper, "There you go Big Momma, i've got you a BMX to match mine now!" It has to be said that Mrs Pistonpopper wasn't too impressed with her new bike, or for that matter the public unveiling of it lol! But she wanted to see it there and then, and besides the other parents thought it was hilarious! It has to be said that in the two days since the unveiling i havn't been called Big Daddy once! 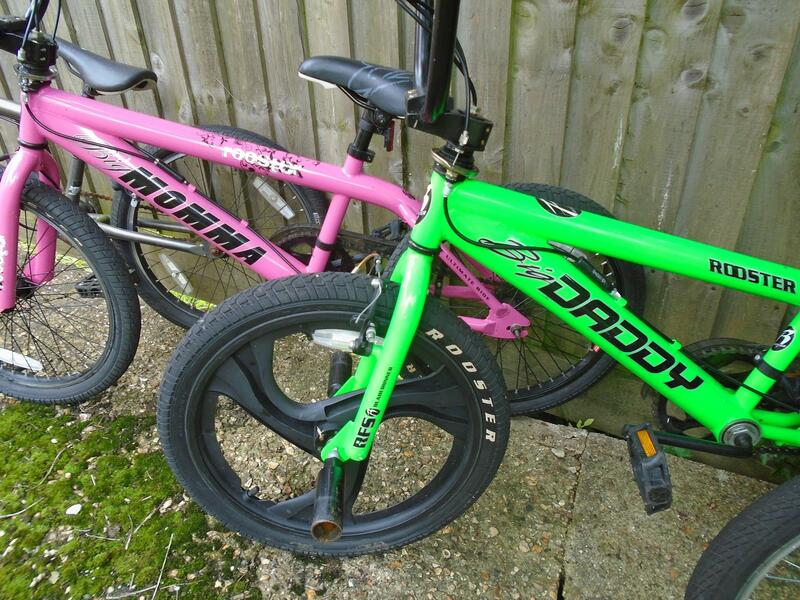 It has to be said though, that i think the Big Daddy, and Big Momma BMX's are cool, and kinda funny that we've got one each! 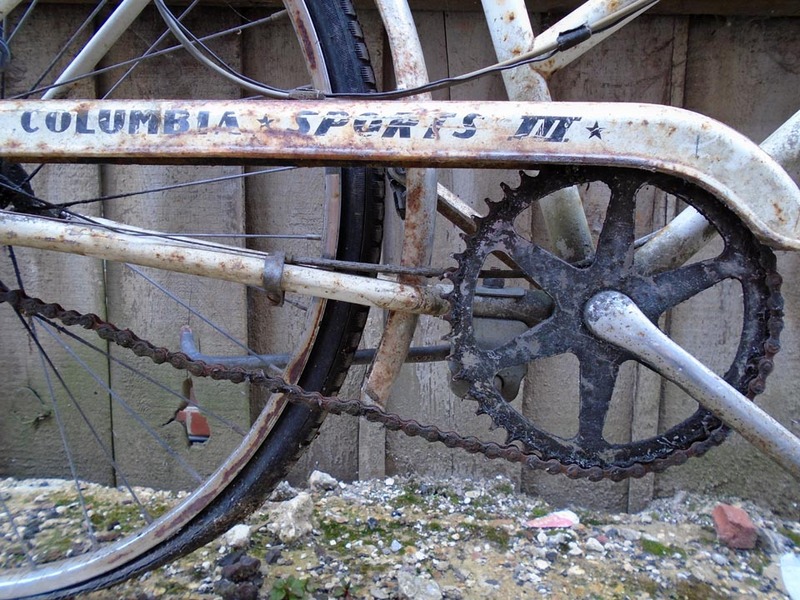 Mrs Pp has ridden hers, and after about two minutes fell off because the chain came off... This didn't please her, just a good thing she didn't do it infront of the others at the barbeque! As for mine, those plastic wheels have to go as i reckon i'm a bit too heavy for a plastic wheel which was probably designed for a child which would be a much lighter payload!